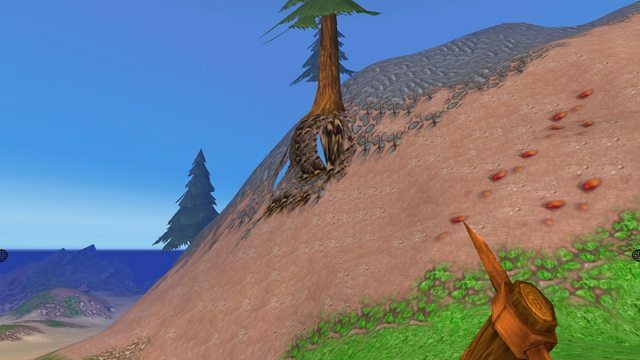 Because the bottom of the trees use the cartoon line shader as their shadow, it probably saves on resources. Not sure if this has been covered but if you notice under the tree there are a few missing graphics. This seems to keep happening to terrain on a similar level. Are you indicating the terrain tearing around roots in that picture? (roots are technically terrain)? (02-22-2012 03:54 AM)Jaguar Wrote: Are you indicating the terrain tearing around roots in that picture? (roots are technically terrain)? Yes the 'missing terrain', the areas that just show abyss. uhm.. I tried searching the forum for it and looked through some posts but I may have missed it. if you dig under the trees they just float there, any thoughts on that? No gravity... That'd be weird... So weird... Floating away.. And you're a dorf.